Finally I got the notification that a subscription spot is available. Of course I snatched it right up. Life and illness caught up with me and so here I am writing about December 2016 when it’s March 2017. The products in the box are still available separately should one get interested enough. I believe there’s a variety of boxes that one may get and for December 2016 I received the December B 2016 box. Each box also includes a Play! Book and a Play! Pass. A Play! 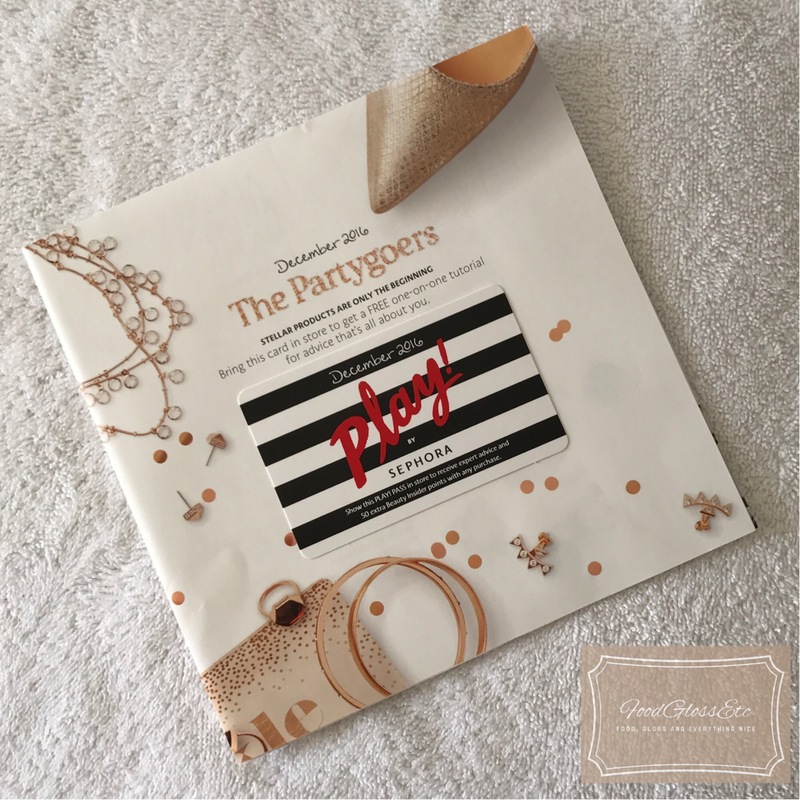 Book is a folded glossy paper with pictures of products featured in the box, tips, tricks and a Play! Pass attached right at the front. 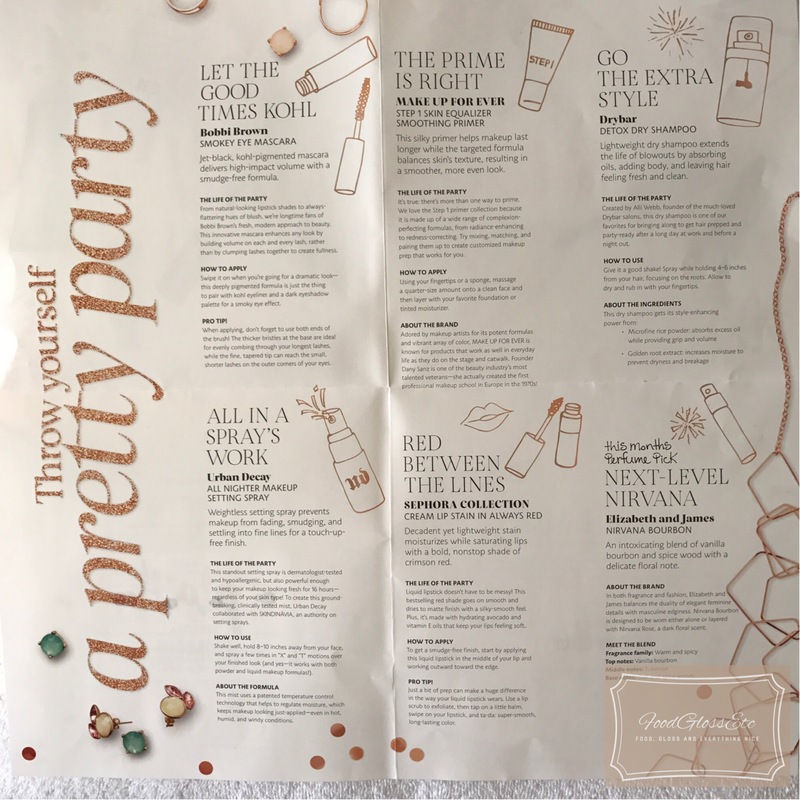 You unfold the glossy to reveal information about the products featured, how to’s, tips and tricks. The Play! 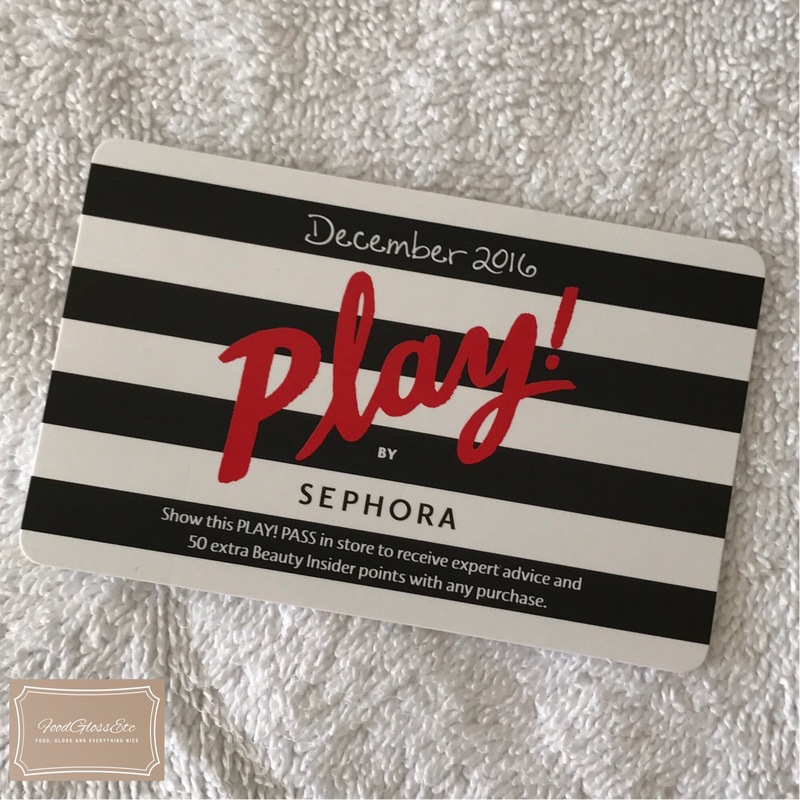 Pass is a card that allows you to have in-store expert advice as well as 50 extra Beauty Insider points with any purchase. Bobbi Brown Smoky Eye Mascara – while I love me some travel sized goodies, this one I have to give away. I’ve tried this one before. I’m not a fan of the brush in general and they smudge on me even after drying down. Urban Decay All Nighter Makeup Setting Spray – I’ve used and repurchased this one before and I’m actually glad to have a small one to take with me during trips. Saves me from having to actually buy a travel size. This product always does its job, keeps things put and puts the oils at bay. I would not say that it is really an “all nighter” for me, I will have to reapply at some point. Makeup For Ever Step 1 Skin Equalizer Smoothing Primer – This particular primer is targeted towards those wanting to even out those pores. This is my first time using this particular product and I find it very silicone-y. It is so hard to look for ingredients online. Usually Sephora has it for other brands but looks like it does not exist for MUFE, even at the MUFE website it’s non-existent. I would bet though that it has silicone. Some people are sensitive to it, I am not. And I don’t mind. It does its job or evening out my skin’s texture particularly the nose and the immediate surroundings where it’s pore-heavy. Would I buy a full size? I’m still on the fence about that. Sephora Collection Cream Lip Stain in Always Red – not my first time trying out this product but bright red is not my color though. I would reserve this for a party or a special occasion. The formula does not do anything for me. I prefer moisturizing ones. Drybar Detox Dry Shampoo – not my first time with this brand and particular product. In fact, I’m a fan of Triple Sec. I prefer it over the Detox for second day hair. It adds volume and hold. Even in freshly washed hair I sometimes use it for the extra oomph! Elizabeth and James Nirvana Bourbon – is the fragrance pick for the December 2016 box. According to the Play! Book, it belongs to the warm and spicy fragrance family with vanilla bourbon top notes, middle notes of tuberose and dries down to its base notes of oak and spice woods. I have a deluxe version of this fragrance and I enjoy it very much. I find it perfect when the Southern California weather system can’t decide if it’s winter or summer. Overall, I am very satisfied with this box. Well worth it’s $10 price tag. The dry shampoo, setting spray, primer and fragrance was and is a staple in my vanity or travel bag. I am going to dish out all the other boxes so I can finally be caught up. So far I’m happy with this subscription. Til next time.